Spring is nearly here (I repeat this mantra even as NC has just wrested with another bout of wintry mess! ), and Fred and I are on the road again. We are so fortunate to be invited to share the Saffron Cross story at some amazing places this year. Please review the spring tour events below. If we are in your neck of the woods, come by and say, “Hi!” Or, if you know someone in the area, please forward them this post. Writers hate to ask for help. First and foremost, we see our jobs as service to you, the readers. We put in long hours and suffer much anxiety over our posts, books, events, and articles in hopes that we somehow engage you the way our writing heroes have massaged our hearts. But we need your help. I need your help. I need YOU: readers, supporters, event-goers, Amazon reviewers, and book-buyers. I love what I do, and I pray that in some tiny way Saffron Cross has ripped off the mask of religious misunderstanding so that we can all take courage in getting to know someone of another faith. 1. Come see us on the spring 2014 tour and share this post with folks you know. Where applicable, register for awesome spiritual formation opportunities (The Upper Room’s SOULFeast and the United Methodist Women Assembly). 2. Consider hosting an event in your community. Booking an event helps us continue to share how interfaith dialogue is an essential skill in our growing diverse communities. We’d love to come to your small group discussions, worship services, and help you determine best practices for your interfaith and multifaith groups. Check out where we’ve been, and highlights from our fall 2013 tour! 3. Stay connected. The goal is conversation; the more we connect, the more we can help one another. We want to build a community of readers who believe in the power of asking questions and facing faith challenges. Like the Facebook page and invite your friends to do so. Follow on Twitter. Let me know what blog posts speak to your heart and what you’d like to see more of. 4. Share how Saffron Cross affected you. What did you struggle with? What massaged your heart? Did Saffron Cross help you ask yourself challenge spiritual questions? Please take a few minutes to leave an Amazon review (it can be 20 words—seriously!). Your thoughts could help someone pick up the book who would have otherwise never considered it! Writers are nothing without readers, so thank you, thank you, thank you. I hold you in my heart each day. 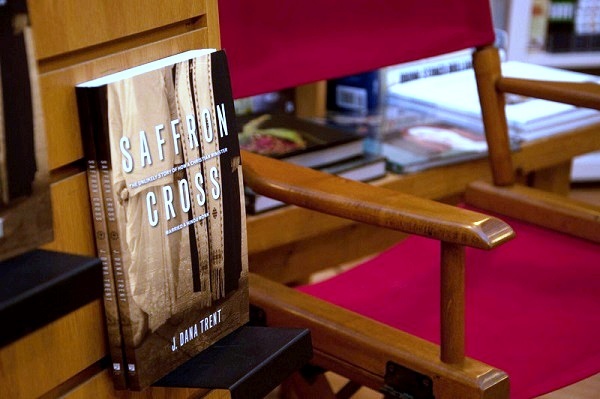 Tuesday, April 15th, 4:00 p.m.: “Saffron Cross Q&A” Reidsville Book Club, Reidsville, NC. Wednesdays, 1:30 p.m., beginning April 16th through May 21st at Judea Reform Congregation, Durham, NC: “Why is Interfaith Deeper Faith,” weekly classes, Duke University’s Osher Life Long Learning Institute. Sunday, July 13th through Thursday July 17th: The Upper Room SOULFeast Spiritual Formation Retreat at Lake Junaluska, NC. Dana will be a featured preacher at evening worship on Monday, July 14th. Next PostNext What Would Jesus Eat?